Yitzhak Laor was born in 1948 in the Israeli village of Pardes Hanna near Haifa. 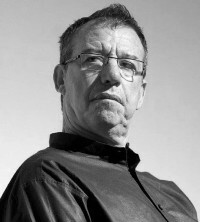 He studied literature at Tel Aviv University, subsequently becoming a lecturer on theatre and dance there and at the school of film in Jerusalem. He was imprisoned in 1972 for refusing military duty in the occupied territories. In his poems, essays and plays he has also dealt critically with political events such as the 1982 Lebanon War and has consistently protested against the oppression of the Palestinians. His drama »Ephraim Hozer La-Tzavah« (1987; tr: Ephraim Returns to the Army), a parody of the kind of anti-hero novel written by the prominent Israeli author S. Yizhar, was initially banned by the censor board for disparaging the military rule in Judea and Sumaria, before the highest appellate court allowed the theatre piece to be performed after all. With Yitzhak Shamir refusing to officially present Laor with the Prime Minister’s Prize for Poetry as late as 1990, the author was honored three years later with the Bernstein Prize for Poetry, which was followed in 1994 by the Hebrew Literature Award. With his novel, »Am, Ma’achal Melachim« (1993; tr: The People: Fodder for a King), published in that period, Laor discovered the potential of prose, which granted him the scope to expose the contradictions of ideology and reality in everyday life in Israel. Switching among multiple perspectives, as well as between sarcasm and melancholy, he uses direct language to bluntly address his country as well as the reader. A review in »Der Freitag« commented: »The fact that the political aspect in Laor’s work merges so effortlessly with the poetic sets it apart from contemporary Israeli literature.« His second novel »Ve-Im Ruhi Geviyati« (2003, tr: Stones, Fences, Voices) eloquently and strongly declares the Lebanon war as a mistake. In it the author addresses questions of identity (including that of his main protagonist) and subversively criticizes the construction of (in particular, national-ethnic) personal and collective images of self and of the other. In 2002, Laor’s third novel »Ecce Homo«, published in German in 2005, was praised by the »Frankfurter Allgemeinen Zeitung« as »tracing leitmotifs of militarism and sexuality, the book’s complex personnel and storylines also allegorize the inner turmoil of the country where it is set«. In 2010 the author’s criticism focused on liberal Zionism, which he dissected in »The Myths of Zionism«. Laor regularly publishes literary criticism in the Israeli daily »Ha’aretz«. Recently he is a guest of the DAAD Artists-in-Berlin Program.